After hours of planning and preparation creating the perfect décor for your event, people often forget about the single largest thing in the room: the dance floor. And while we love our classic black or crisp white dance floors to add a classy flair to your room, nothing brings the wow-factor quite like an LED lighted dance floor. Our LED dance floor puts on a show of its own. Lights will always be dancing across the floor even when your guests aren’t. Customized designs and color patterns light up the floor, mesmerizing your guests with the spectacular aesthetic. So even if the lights aren’t turned on, the clean white floor looks beautiful on it’s on. The Party Excitement team works closely with you to create the perfect size, color and designed floor specialized for your event. 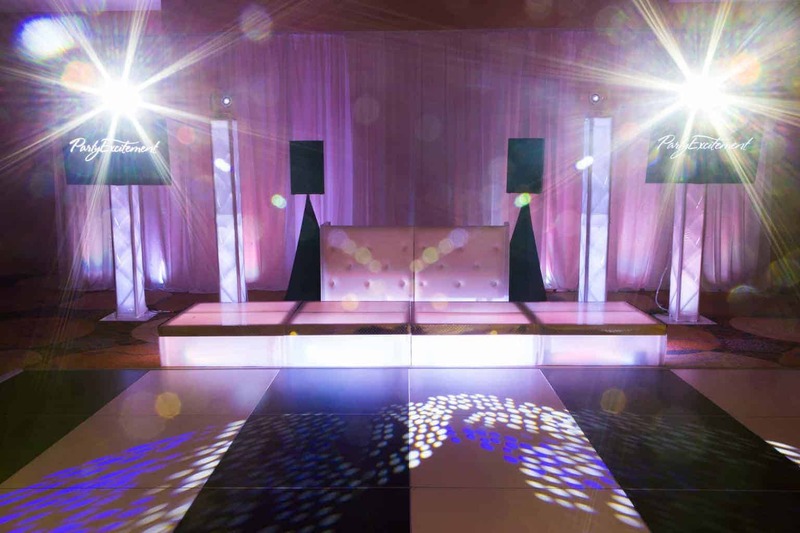 The dance floor utilizes the newest technology and lies almost perfectly level with the natural floor, giving you and your guests the best experience possible. The LED dance floor truly makes your event stand out as one to remember. The LED dance floor is quickly becoming a party favorite. Once you see it, you have to have it.